I’m back with another sushi recipe! I didn’t actually plan to post this one, as it was my usual throw together the contents of the fridge and call it a meal, but I really loved the combination of creamy avocado, sweet mango and fresh peppery radish, rolled up in nutty brown sushi rice. These sushi rolls are simple, healthy and light, which is exactly what I need at the moment. I have just under five months until I’m supposed to be bikini-ready and let’s just say… I could use a few months more. I can’t complain though, because that also means it’s less than five months until I set off on my travels to Bali and then Australia. Ahhh, sunshine. This recipe makes enough for two rolls of sushi, which should make 6-8 bites each, depending on how thick you slice them. Be sure to use a wet sharp knife to slice, to avoid sticking. 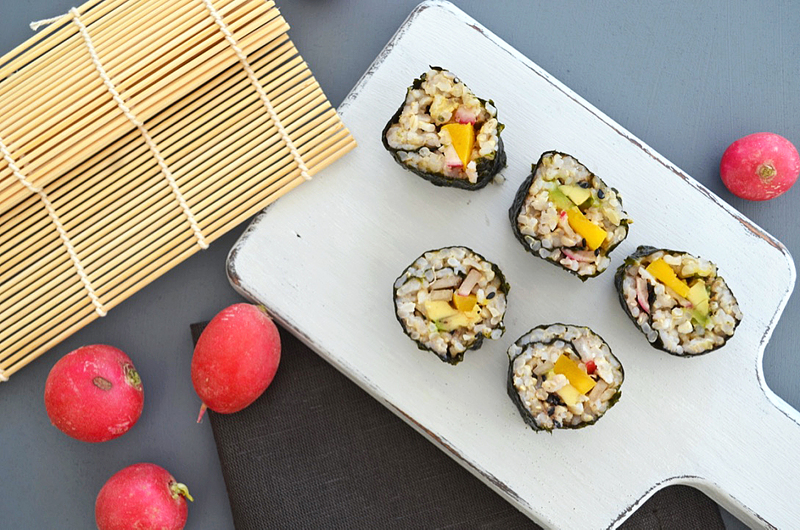 A light, healthy sushi roll with creamy avocado, sweet mango and fresh peppery radish. Cook sushi rice according to directions. Set aside until completely cool. Thinly slice the avocado, mango and radishes. Place a nori sheet onto a bamboo mat, wet your hands and spread half the rice onto the sheet, pressing down firmly, leaving about an inch at the edge to make a seam. Lay the sliced avocado, mango and radish in a line down the middle of the rice, then sprinkle with black sesame seeds. Carefully use the bamboo mat to roll the seaweed and rice around the filling, squeezing firmly. Repeat this process for the second roll. Place both of the rolls into the fridge for 15-20 minutes to firm up, then slice using a wet knife to avoid sticking. Serve with soy sauce for dipping, and enjoy. If you don't have a bamboo mat, you can also use a sheet of cling film on a clean tea towel to wrap your sushi.